It has been requested that the title of this article be changed to Meiji (era). Please see the relevant discussion on the discussion page. The page should not be moved unless the discussion is closed; summarizing the consensus achieved in support of the move. The Meiji period (明治時代, Meiji-jidai), or Meiji era, is an era of Japanese history which extended from October 23, 1868 to July 30, 1912. This era represents the first half of the Empire of Japan, during which period the Japanese people moved from being an isolated feudal society at risk of colonisation by European powers to the new paradigm of a modern, industrialised nationstate and emergent great power, influenced by Western scientific, technological, philosophical, political, legal, and aesthetic ideas. As a result of such wholesale adoption of radically-different ideas, the changes to Japan were profound, and affected its social structure, internal politics, economy, military, and foreign relations. The period corresponded to the reign of Emperor Meiji and was succeeded upon the accession of Emperor Taishō by the Taishō period. On February 3, 1867, the 14-year-old Prince Mutsuhito succeeded his father, Emperor Kōmei, to the Chrysanthemum Throne as the 122nd emperor. On November 9, 1867, then-shōgun Tokugawa Yoshinobu tendered his resignation to the Emperor, and formally stepped down ten days later. Imperial restoration occurred the next year on January 3, 1868, with the formation of the new government. The fall of Edo in the summer of 1868 marked the end of the Tokugawa shogunate, and a new era, Meiji, was proclaimed. Implicit in the Charter Oath was an end to exclusive political rule by the bakufu (a shōgun's direct administration including officers), and a move toward more democratic participation in government. To implement the Charter Oath, a rather short-lived constitution with eleven articles was drawn up in June 1868. Besides providing for a new Council of State, legislative bodies, and systems of ranks for nobles and officials, it limited office tenure to four years, allowed public balloting, provided for a new taxation system, and ordered new local administrative rules. The Meiji government assured the foreign powers that it would follow the old treaties negotiated by the bakufu and announced that it would act in accordance with international law. Mutsuhito, who was to reign until 1912, selected a new reign title—Meiji, or Enlightened Rule—to mark the beginning of a new era in Japanese history. To further dramatize the new order, the capital was relocated from Kyoto, where it had been situated since 794, to Tokyo (Eastern Capital), the new name for Edo. In a move critical for the consolidation of the new regime, most daimyōs voluntarily surrendered their land and census records to the Emperor in the abolition of the Han system, symbolizing that the land and people were under the Emperor's jurisdiction. Confirmed in their hereditary positions, the daimyo became governors, and the central government assumed their administrative expenses and paid samurai stipends. The han were replaced with prefectures in 1871, and authority continued to flow to the national government. Officials from the favored former han, such as Satsuma, Chōshū, Tosa, and Hizen staffed the new ministries. Formerly old court nobles, and lower-ranking but more radical samurai, replaced bakufu appointees and daimyo as a new ruling class appeared. In as much as the Meiji Restoration had sought to return the Emperor to a preeminent position, efforts were made to establish a Shinto-oriented state much like it was 1,000 years earlier. Since Shinto and Buddhism had molded into a syncretic belief in the prior one-thousand years and Buddhism had been closely connected with the shogunate, this involved the separation of Shinto and Buddhism (shinbutsu bunri) and the associated destruction of various Buddhist temples and related violence (haibutsu kishaku). Furthermore, a new State Shinto had to be constructed for the purpose. In 1871, the Office of Shinto Worship (ja:神祇省) was established, ranking even above the Council of State in importance. The kokutai ideas of the Mito school were embraced, and the divine ancestry of the Imperial House was emphasized. The government supported Shinto teachers, a small but important move. 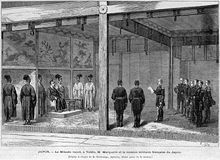 Although the Office of Shinto Worship was demoted in 1872, by 1877 the Home Ministry controlled all Shinto shrines and certain Shinto sects were given state recognition. Shinto was released from Buddhist administration and its properties restored. Although Buddhism suffered from state sponsorship of Shinto, it had its own resurgence. Christianity also was legalized, and Confucianism remained an important ethical doctrine. Increasingly, however, Japanese thinkers identified with Western ideology and methods. A major proponent of representative government was Itagaki Taisuke (1837–1919), a powerful Tosa leader who had resigned from the Council of State over the Korean affair in 1873. Itagaki sought peaceful, rather than rebellious, means to gain a voice in government. He started a school and a movement aimed at establishing a constitutional monarchy and a legislative assembly. Such movements were called The Freedom and People's Rights Movement. Itagaki and others wrote the Tosa Memorial (ja:民撰議院設立建白書) in 1874, criticizing the unbridled power of the oligarchy and calling for the immediate establishment of representative government. Between 1871 and 1873, a series of land and tax laws were enacted as the basis for modern fiscal policy. Private ownership was legalized, deeds were issued, and lands were assessed at fair market value with taxes paid in cash rather than in kind as in pre-Meiji days and at slightly lower rates. Dissatisfied with the pace of reform after having rejoined the Council of State in 1875, Itagaki organized his followers and other democratic proponents into the nationwide Aikokusha (Society of Patriots) to push for representative government in 1878. In 1881, in an action for which he is best known, Itagaki helped found the Jiyūtō (Liberal Party), which favored French political doctrines. In 1882, Ōkuma Shigenobu established the Rikken Kaishintō (Constitutional Progressive Party), which called for a British-style constitutional democracy. In response, government bureaucrats, local government officials, and other conservatives established the Rikken Teiseitō (Imperial Rule Party), a pro-government party, in 1882. Numerous political demonstrations followed, some of them violent, resulting in further government restrictions. The restrictions hindered the political parties and led to divisions within and among them. The Jiyūtō, which had opposed the Kaishinto, was disbanded in 1884 and Ōkuma resigned as Kaishintō president. Government leaders, long preoccupied with violent threats to stability and the serious leadership split over the Korean affair, generally agreed that constitutional government should someday be established. 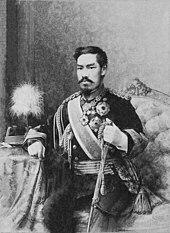 The Chōshū leader Kido Takayoshi had favored a constitutional form of government since before 1874, and several proposals for constitutional guarantees had been drafted. While acknowledging the realities of political pressure, however, the oligarchy was determined to keep control. Thus, modest steps were taken. The Osaka Conference in 1875 resulted in the reorganization of government with an independent judiciary and an appointed Chamber of Elders (Genrōin) tasked with reviewing proposals for a legislature. The Emperor declared that "constitutional government shall be established in gradual stages" as he ordered the Council of Elders to draft a constitution. Three years later, the Conference of Prefectural Governors established elected prefectural assemblies. Although limited in their authority, these assemblies represented a move in the direction of representative government at the national level, and by 1880 assemblies also had been formed in villages and towns. In 1880 delegates from twenty-four prefectures held a national convention to establish the Kokkai Kisei Dōmei (League for the Establishment of a National Assembly). Although the government was not opposed to parliamentary rule, confronted with the drive for "people's rights", it continued to try to control the political situation. New laws in 1875 prohibited press criticism of the government or discussion of national laws. The Public Assembly Law (1880) severely limited public gatherings by disallowing attendance by civil servants and requiring police permission for all meetings. Within the ruling circle, however, and despite the conservative approach of the leadership, Okuma continued as a lone advocate of British-style government, a government with political parties and a cabinet organized by the majority party, answerable to the national assembly. He called for elections to be held by 1882 and for a national assembly to be convened by 1883; in doing so, he precipitated a political crisis that ended with an 1881 imperial rescript declaring the establishment of a national assembly in 1890 and dismissing Okuma. Rejecting the British model, Iwakura and other conservatives borrowed heavily from the Prussian constitutional system. One of the Meiji oligarchy, Itō Hirobumi (1841–1909), a Chōshū native long involved in government affairs, was charged with drafting Japan's constitution. He led a constitutional study mission abroad in 1882, spending most of his time in Germany. He rejected the United States Constitution as "too liberal", and the British system as too unwieldy, and having a parliament with too much control over the monarchy; the French and Spanish models were rejected as tending toward despotism. Ito was put in charge of the new Bureau for Investigation of Constitutional Systems in 1884, and the Council of State was replaced in 1885 with a cabinet headed by Ito as prime minister. The positions of chancellor (or chief-minister), minister of the left, and minister of the right, which had existed since the seventh century as advisory positions to the Emperor, were all abolished. In their place, the Privy Council was established in 1888 to evaluate the forthcoming constitution and to advise the Emperor. To further strengthen the authority of the State, the Supreme War Council was established under the leadership of Yamagata Aritomo (1838–1922), a Chōshū native who has been credited with the founding of the modern Japanese army and was to become the first constitutional Prime Minister. The Supreme War Council developed a German-style general staff system with a chief of staff who had direct access to the Emperor and who could operate independently of the army minister and civilian officials. When finally granted by the Emperor as a sign of his sharing his authority and giving rights and liberties to his subjects, the 1889 Constitution of the Empire of Japan (or Meiji Constitution) provided for the Imperial Diet (Teikoku Gikai), composed of a popularly elected House of Representatives with a very limited franchise of male citizens who were over twenty-five years of age and paid fifteen yen in national taxes, about one percent of the population, and the House of Peers, composed of nobility and imperial appointees; and a cabinet responsible to the Emperor and independent of the legislature. The Diet could approve government legislation and initiate laws, make representations to the government, and submit petitions to the Emperor. Nevertheless, in spite of these institutional changes, sovereignty still resided in the Emperor on the basis of his divine ancestry. The new constitution specified a form of government that still was authoritarian in character, with the Emperor holding the ultimate power and only minimal concessions made to popular rights and parliamentary mechanisms. Party participation was recognized as part of the political process. The Meiji Constitution was to last as the fundamental law until 1947. In the early years of constitutional government, the strengths and weaknesses of the Meiji Constitution were revealed. A small clique of Satsuma and Chōshū elite continued to rule Japan, becoming institutionalized as an extra-constitutional body of genrō (elder statesmen). Collectively, the genro made decisions reserved for the Emperor, and the genro, not the Emperor, controlled the government politically. Throughout the period, however, political problems usually were solved through compromise, and political parties gradually increased their power over the government and held an ever-larger role in the political process as a result. Between 1891 and 1895, Ito served as Prime Minister with a cabinet composed mostly of genro who wanted to establish a government party to control the House of Representatives. Although not fully realized, the trend toward party politics was well established. On its return, one of the first acts of the government was to establish new ranks for the nobility. Five hundred people from the old court nobility, former daimyo, and samurai who had provided valuable service to the Emperor were organized into a new peerage, the Kazoku, consisting of five ranks: prince, marquis, count, viscount, and baron. In the transition between the Edo and Meiji periods, the Ee ja nai ka movement, a spontaneous outbreak of ecstatic behavior, took place. In 1885, noted public intellectual Yukichi Fukuzawa wrote the influential essay "Leaving Asia", arguing that Japan should orient itself at the "civilized countries of the West", leaving behind the "hopelessly backward" Asian neighbors, namely Korea and China. This essay certainly encouraged the economic and technological rise of Japan in the Meiji period, but it also may have laid the intellectual foundations for later Japanese colonialism in the region. The Meiji period saw a flowering of public discourse on the direction of Japan. Works like Nakae Chōmin's A Discourse by Three Drunkards on Government debated how best to blend the new influences coming from the West with local Japanese culture. Grassroots movements like the Freedom and People's Rights Movement called for the establishment of a formal legislature, civil rights, and greater pluralism in the Japanese political system. Journalists, politicians, and writers actively participated in the movement, which attracted an array of interest groups, including women's rights activists. The elite class of the Meiji period adapted many aspects of Victorian taste, as seen in the construction of Western-style pavilions and reception rooms called yōkan or yōma in their homes. These parts of Meiji homes were displayed in popular magazines of the time, such as Ladies' Graphic, which portrayed the often empty rooms of the homes of the aristocracy of all levels, including the imperial palaces. Integrating Western cultural forms with an assumed, untouched native Japanese spirit was characteristic of Meiji society, especially at the top levels, and represented Japan's search for a place within a new world power system in which European colonial empires dominated. The Industrial Revolution in Japan occurred during the Meiji period. The industrial revolution began about 1870 as Meiji period leaders decided to catch up with the West. The government built railroads, improved roads, and inaugurated a land reform program to prepare the country for further development. It inaugurated a new Western-based education system for all young people, sent thousands of students to the United States and Europe, and hired more than 3,000 Westerners to teach modern science, mathematics, technology, and foreign languages in Japan (O-yatoi gaikokujin). In 1871, a group of Japanese politicians known as the Iwakura Mission toured Europe and the US to learn western ways. The result was a deliberate state led industrialisation policy to enable Japan to quickly catch up. The Bank of Japan, founded in 1877, used taxes to fund model steel and textile factories. Modern industry first appeared in textiles, including cotton and especially silk, which was based in home workshops in rural areas. Due to the importing of new textile manufacturing technology from Europe, between 1886 and 1897, Japan's total value of yarn output rose from 12 million to 176 million yen. In 1886, 62% of yarn in Japan was imported; by 1902, most yarn was produced locally. By 1913, Japan was producing 672 million pounds of yarn per year, becoming the fourth largest exporter of cotton yarn. The first railway was opened between Tokyo and Yokohama in 1872; and railway was rapidly developed throughout Japan well into the twentieth century. The introduction of railway transportation led to more efficient production due to the decline in transport costs; allowing for manufacturing firms to move into more populated interior regions of Japan in search for labour input. The railway also enabled a new-found access to raw materials that had previously been too difficult or costly to transport. There were at least two reasons for the speed of Japan's modernization: the employment of more than 3,000 foreign experts (called o-yatoi gaikokujin or 'hired foreigners') in a variety of specialist fields such as teaching English, science, engineering, the army and navy, among others; and the dispatch of many Japanese students overseas to Europe and America, based on the fifth and last article of the Charter Oath of 1868: 'Knowledge shall be sought throughout the world so as to strengthen the foundations of Imperial rule.' This process of modernization was closely monitored and heavily subsidized by the Meiji government, enhancing the power of the great zaibatsu firms such as Mitsui and Mitsubishi. Hand in hand, the zaibatsu and government guided the nation, borrowing technology from the West. Japan gradually took control of much of Asia's market for manufactured goods, beginning with textiles. The economic structure became very mercantilistic, importing raw materials and exporting finished products—a reflection of Japan's relative poverty in raw materials. Japan emerged from the Tokugawa–Tennō (Keiō–Meiji) transition in 1868 as the first Asian industrialized nation. Domestic commercial activities and limited foreign trade had met the demands for material culture until the Keiō period, but the modernized Meiji period had radically different requirements. From the onset, the Meiji rulers embraced the concept of a market economy and adopted British and North American forms of free enterprise capitalism. The private sector—in a nation with an abundance of aggressive entrepreneurs—welcomed such change. Economic reforms included a unified modern currency based on the yen, banking, commercial and tax laws, stock exchanges, and a communications network. Establishment of a modern institutional framework conducive to an advanced capitalist economy took time, but was completed by the 1890s. By this time, the government had largely relinquished direct control of the modernization process, primarily for budgetary reasons. Many of the former daimyo, whose pensions had been paid in a lump sum, benefited greatly through investments they made in emerging industries. Those who had been informally involved in foreign trade before the Meiji Restoration also flourished. Old bakufu-serving firms that clung to their traditional ways failed in the new business environment. The government initially was involved in economic modernization, providing a number of "model factories" to facilitate the transition to the modern period. After the first twenty years of the Meiji period, the industrial economy expanded rapidly until about 1920 with inputs of advanced Western technology and large private investments. Stimulated by wars and through cautious economic planning, Japan emerged from World War I as a major industrial nation. In 1885, the Meiji government sponsored a telegraph system, throughout Japan, situating the telegraphs in all major Japanese cities at the time. Undeterred by opposition, the Meiji leaders continued to modernize the nation through government-sponsored telegraph cable links to all major Japanese cities and the Asian mainland and construction of railroads, shipyards, munitions factories, mines, textile manufacturing facilities, factories, and experimental agriculture stations. Greatly concerned about national security, the leaders made significant efforts at military modernization, which included establishing a small standing army, a large reserve system, and compulsory militia service for all men. Foreign military systems were studied, foreign advisers, especially French ones, were brought in, and Japanese cadets sent abroad to Europe and the United States to attend military and naval schools. In 1854, after Admiral Matthew C. Perry forced the signing of the Treaty of Kanagawa, Japanese elites took the position that they needed to modernize the state's military capacities, or risk further coercion from Western powers. The Tokugawa shogunate did not officially share this point of view, however, as evidenced by the imprisonment of the Governor of Nagasaki, Shanan Takushima for voicing his views of military reform and weapons modernization. In 1868, the Japanese government established the Tokyo Arsenal. This arsenal was responsible for the development and manufacture of small arms and associated ammunition. The same year, Ōmura Masujirō established Japan's first military academy in Kyoto. Ōmura further proposed military billets be filled by all classes of people including farmers and merchants. The shōgun class,[clarification needed] not happy with Ōmura's views on conscription, assassinated him the following year. In 1870, Japan expanded its military production base by opening another arsenal in Osaka. The Osaka Arsenal was responsible for the production of machine guns and ammunition. Also, four gunpowder facilities also were opened at this site. Japan's production capacity gradually expanded. In 1872, Yamagata Aritomo and Saigō Jūdō, both new field marshals, founded the Corps of the Imperial Guards. This corps was composed of the warrior classes from the Tosa, Satsuma, and Chōshū clans. Also, in the same year, the hyobusho (war office) was replaced with a War Department and a Naval Department. The samurai class suffered great disappointment the following years, when in January the Conscription Law of 1873 was passed. This law required every able-bodied male Japanese citizen, regardless of class, to serve a mandatory term of three years with the first reserves and two additional years with the second reserves. This monumental law, signifying the beginning of the end for the samurai class, initially met resistance from both the peasant and warrior alike. The peasant class interpreted the term for military service, ketsu-eki (blood tax) literally, and attempted to avoid service by any means necessary. Avoidance methods included maiming, self-mutilation, and local uprisings. The samurai were generally resentful of the new, western-style military and at first, refused to stand in formation with the peasant class. Emperor Meiji receives the second French Military Mission to Japan (1872). In conjunction with the new conscription law, the Japanese government began modeling their ground forces after the French military. Indeed, the new Japanese army used the same rank structure as the French. The enlisted corps ranks were: private, noncommissioned officers, and officers. The private classes were: jōtō-hei or upper soldier, ittō-sotsu or first-class soldier, and nitō-sotsu or second-class soldier. The noncommissioned officer class ranks were: gochō or corporal, gunsō or sergeant, sōchō or sergeant major, and tokumu-sōchō or special sergeant major. Finally, the officer class is made up of: shōi or second lieutenant, chūi or first lieutenant, tai or captain, shōsa or major, chūsa or lieutenant colonel, taisa or colonel, shōshō or major general, chūjō or lieutenant general, taishō or general, and gensui or field marshal. The French government also contributed greatly to the training of Japanese officers. Many were employed at the military academy in Kyoto, and many more still were feverishly translating French field manuals for use in the Japanese ranks. Despite the Conscription Law of 1873, and all the reforms and progress, the new Japanese army was still untested. That all changed in 1877, when Saigō Takamori led the last rebellion of the samurai in Kyūshū. In February 1877, Saigō left Kagoshima with a small contingent of soldiers on a journey to Tokyo. Kumamoto castle was the site of the first major engagement when garrisoned forces fired on Saigō's army as they attempted to force their way into the castle. Rather than leave an enemy behind him, Saigō laid siege to the castle. Two days later, Saigō's rebels, while attempting to block a mountain pass, encountered advanced elements of the national army en route to reinforce Kumamoto castle. After a short battle, both sides withdrew to reconstitute their forces. A few weeks later the national army engaged Saigō's rebels in a frontal assault at what now is called the Battle of Tabaruzuka. During this eight-day-battle, Saigō's nearly ten thousand strong army battled hand-to-hand the equally matched national army. Both sides suffered nearly four thousand casualties during this engagement. Due to conscription, however, the Japanese army was able to reconstitute its forces, while Saigō's was not. Later, forces loyal to the emperor broke through rebel lines and managed to end the siege on Kumamoto Castle after fifty-four days. Saigō's troops fled north and were pursued by the national army. The national army caught up with Saigō at Mt. Enodake. Saigō's army was outnumbered seven-to-one, prompting a mass surrender of many samurai. The remaining five hundred samurai loyal to Saigō escaped, travelling south to Kagoshima. The rebellion ended on September 24, 1877, following the final engagement with Imperial forces which resulted in the deaths of the remaining forty samurai including Saigō, who, having suffered a fatal bullet wound in the abdomen, was honourably beheaded by his retainer. The national army's victory validated the current course of the modernization of the Japanese army as well as ended the era of the samurai. When the United States Navy ended Japan's sakoku policy, and thus its isolation, the latter found itself defenseless against military pressures and economic exploitation by the Western powers. For Japan to emerge from the feudal period, it had to avoid the colonial fate of other Asian countries by establishing genuine national independence and equality. Following the María Luz Incident, Japan released the Chinese coolies from a western ship in 1872, after which the Qing imperial government of China gave thanks to Japan. Following Japan's victory over China in the First Sino-Japanese War (1894–1895), Japan broke through as an international power with a victory against Russia in Manchuria (north-eastern China) in the Russo-Japanese War of 1904–1905. Allied with Britain since the Anglo-Japanese Alliance signed in London on January 30, 1902, Japan joined the Allies in World War I, seizing German-held territory in China and the Pacific in the process, but otherwise remained largely out of the conflict. Following the World War I, a weakened Europe left a greater share in international markets to the United States and Japan, which emerged greatly strengthened. Japanese competition made great inroads into hitherto-European-dominated markets in Asia, not only in China, but even in European colonies such as India and Indonesia, reflecting the development of the Meiji era. ^ Nussbaum, Louis-Frédéric. (2005). "Meiji" in Japan encyclopedia, p. 624, p. 624, at Google Books; n.b., Louis-Frédéric is pseudonym of Louis-Frédéric Nussbaum, see Deutsche Nationalbibliothek Authority File. ^ Nakae, C. and Tsukui, N. and Hammond, J. A Discourse by Three Drunkards on Government. 1984. ^ Hane, M. Reflections on the Way to the Gallows: Rebel Women in Prewar Japan. University of California Press. 1988. ^ Sand, Jordan (2000). "Was Meiji Taste in Interiors "Orientalist?"". Positions: East Asia Cultures Critique. Duke University Press. 8 (3): 637–673. doi:10.1215/10679847-8-3-637. ^ Landes, David S. (1999). The Wealth and Poverty of Nations: Why Some Are So Rich and Some So Poor. New York: Norton. pp. 379–80. ^ Tang, John P. (September 2014). "Railroad Expansion and Industrialization: Evidence from Meiji Japan". The Journal of Economic History. 74 (3): 863–886. doi:10.1017/S002205071400062X – via CRKN Cambridge University Press Journals. ^ a b c d e f g GlobalSecurity.org (2008). ^ National Diet Library (2008). GlobalSecurity.org (2008). Meiji military. Retrieved August 5, 2008. Kublin, H. (November 1949). The "modern" army of early meiji Japan. The Far East Quarterly, [9(1)], 20–41. National Diet Library (n.d.). Osaka army arsenal (osaka hohei kosho). Retrieved August 5, 2008. Rickman, J. (2003).Sunset of the samurai. Military History. August, 42–49. Shinsengumihq.com, (n.d.). No sleep, no rest: Meiji law enforcement. [dead link] Retrieved August 5, 2008. 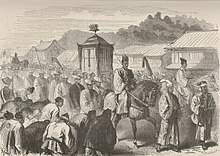 Wikimedia Commons has media related to Meiji era. Lt. John T. Alderson collection of Japan photographs. circa 1890s. 40 photographic prints (1 box) : hand colored ; sizes vary. At the University of Washington Libraries, Special Collections.